We are more than happy to welcome Riad Djemili and Johannes Kristmann from Maschinen-Mensch with their game The Curious Expedition for our first event. 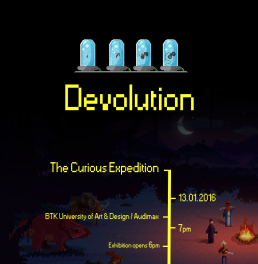 Devolution is a free game design focused event exploring the creative process and challenges of game development. Each event focalises on the evolution of a game through the exhibition of prototypes and interim versions and an in-depth conversation with the developers. How did the game change during its development? Why? Which features were added? Which were taken away? When? What were the interesting design challenges? What was the original vision of the game? How did the idea emerged? How did certain features evolved into their final version? How did testing and feedback affected the game? What the hell is creativity? What is the connection of all this to business and technology? What might the future hold? Maschinen-Mensch is a small game studio in Berlin recently founded by the former triple-A developers Riad Djemili (Code & Design) and Johannes Kristmann (Art & Design). The Curious Expedition, a fantastical expedition simulation game set in the 19th century, is their debut title and was released in 2015 on Steam Early Access.